Teaching your family good table manners can be simple and fun! Why are table manners so important? #1- Good table manners set the foundation for other important manners like respect for others, self-confidence, and being considerate. It all starts at the family table. I stopped my nagging and pleading at the table and found a better way. With a little time and planning, my family mastered the habits of good table manners. I’ve since used that experience to create my online Family Table Manners Boot Camp (get a free lesson delivered to your inbox by clicking here). Set a good example. If you need a brush up on table manners, that’s a-okay! There are many good books on the subject. My favorite resource is the 19th edition of Emily Post’s Etiquette. Make a list of the table manners that you want your family to master. Then break down the list into mini-lessons. Teach them one or two table manners skills a week. Concentrate on one at a time and then layer on new learning. Remember, table manners aren’t just for special occasions. Your goal is to make good table manners part of your children’s everyday habits, so this means using manners at every meal and in every setting. Whether it’s breakfast at home, a quick lunch at Subway, or a special dinner at a restaurant- manners matter. Set a family goal to complete your list of table manners learning by a certain date. When you do, celebrate! Go out for a nice dinner or bake a special dessert. 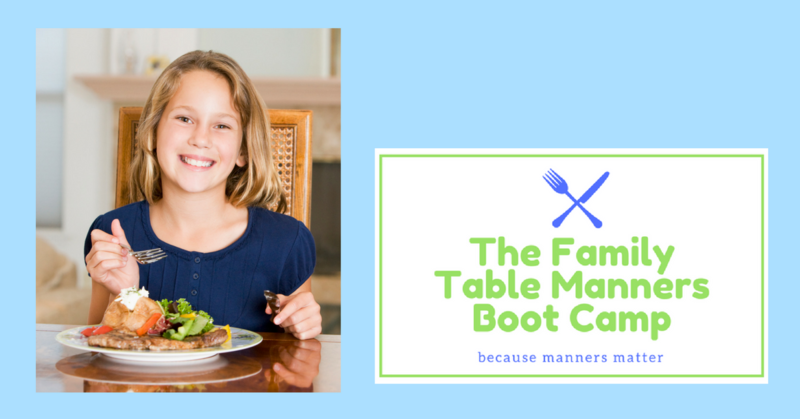 Join my Family Table Manners Boot Camp online course. It’s like I’m with you at your family table guiding you through table manners learning one lesson at a time. All you need is a screen and my course! You’ll receive short, easy to follow lessons plus printable Parent Notes. Your family simply views a lesson at the beginning of your meal and then practice together while you eat. It’s easy and fun! You may complete the Boot Camp at your own pace. Curious? Try it out! Enter your email address below and I’ll send you a free lesson right away.